I was the first one up. A light dust of snow had fallen during the night. I woke my two brothers, and we tore down the stairs. I slid, knees first, half way across the hardwood living room floor, stopping just inches from the tiny thatched-roof manger scene under the ornamented, blinking Christmas tree. I reached for the biggest present and tried not to show my disappointment. It was tagged for my brother: “To: Greg. From: Santa.” I handed it off and quickly grabbed the next box. It was smaller, but heavier. Yes! This one was marked for me. I remember a lot of Christmas mornings like that. When I was little, it was difficult to keep in mind what Christmas was really about. 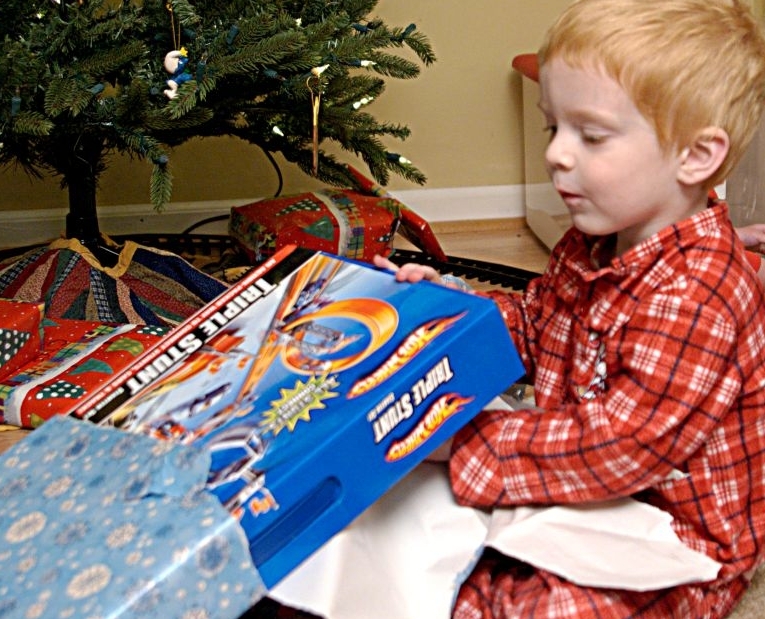 As a child, I was focused on the gifts. Children still are. Even so, my mother and my Catholic school teachers kept trying to keep at least some of the attention of the season on Jesus. When they were successful, what I heard about was the birth of the Christ child. But the birth is not the whole story. Growing up, most of us learned what we think of as the “real” story of Christmas. Mary, who is nine months pregnant, and Joseph are travelling to Bethlehem. When they arrive, there is no room for them at the inn. So they find space in a stable where the animals sleep. Jesus is born that night, and Mary uses a feed trough—a manger—for a crib. Angels sing. Kings arrive. There is a drummer boy somewhere in the mix. It’s a compelling story, but it is easy to miss the point. Only one of the four gospel writers, St. Luke, tells the story this way. And he never knew Jesus personally. So there may be some embellishments. Or perhaps the story happened exactly as he said. But there is no way to know for sure. What we do know for sure is that Luke had a very important reason for telling the story the way he told it. To understand the point of the story, we have to think about things from God’s point of view (which is impossible, but play along). We have to ask, why would God become human? Seriously, if you had a choice between being God or being you, which would you pick? Now, before you answer too quickly, here’s a catch. If you choose to be God, that means that everyone and everything you love won’t really get you anymore. They won’t even see you. They will probably ignore you and maybe even forget about you. In a really oversimplified way, that is something like what happened to God. The Old Testament is filled with stories of God breaking into the human world to show us how much we are loved. Creation itself is an act of love. The fact that we got made in the first place is all about God loving us into existence. The story of Noah and the great flood is a story about God saving us because we are loved. The whole saga of the ancient Israelites fleeing from slavery and crossing the Red Sea into the Promised Land is a story of God’s great love for us. And the stories go on and on. But throughout all of history, we had a really bad habit of forgetting all the things God has done for us and how much God loves us. "God is love, and he who abides in love abides in God, and God abides in him" (1 Jn 4:16). These words from the First Letter of John express with remarkable clarity the heart of the Christian faith: the Christian image of God and the resulting image of mankind and its destiny. In the same verse, Saint John also offers a kind of summary of the Christian life: "We have come to know and to believe in the love God has for us". So God literally became us—became human—as an ultimate act of love. Around Christmas time, we can sometimes sentimentalize this amazing act of love. We get a little caught up in the romance of a cute little baby, surrounded by farm animals and kings bearing gifts in a cozy little stable. But underneath that postcard image is a powerful and even frightening reality. And this was St. Luke’s point: The God of All chose to take on human form. That means God somehow gave up being God or being like God for a little while. Even more incredibly, for God to be born meant God would eventually have to die. And here is the other amazing thing. Remember earlier I said that we know God is love because Jesus is so loving? That total, unconditional, unending love Jesus poured out during his life on earth was completely human. No miracles, no divine slight of hand. In other words, we have within us the same ability to love as Jesus did. The difference is, Jesus was willing to make the sacrifice required—even if it meant loving his enemies—to show such boundless love to everyone he encountered. How did you think about Christmas growing up? Has your idea of Christmas changed? If you were God and had the choice to become human, would you? Why or why not? How could Jesus be God and not know he was God? Or do you think he did know? Posted on Tuesday, November 30th, 2010 at 4:21 pm	under Catholic beliefs, Jesus.